"Through CEM Internship, God invited me to participate in the awesome work of His healing and redemptive love...I am so grateful for my time at CEM." "I've experienced so much love, community, challenges, personal growth, observing growth in students, and awareness of God's presence here that I could not have hoped to find anywhere else." "Internship has become my greatest investment, my greatest profit yet. All that came with it was truly enabling me to identify my personal purpose in life...Thank you CEM for allowing me to experience the pretty, the ugly, the highs, the lows, and everything else in between." "My time at the Ranch was the best year of my life. To serve, to love, to find family, to be together in the brokenness, and to see the healing power of Christ." "I love how God is refining me and growing me in areas I never expected to be stretched in. A lot of times, I focus on solely working from my strengths. God has just amazed me in how he’s molding me and teaching me to be a more 'well-rounded' follower of Him, pushing me to work and grow in my weakness." "My internship taught me to rely more than ever on God. The one thing that sustained me and gave me effectiveness throughout my two years more than anything else was the power of God. This is not just a 'Sunday school answer,' but the simple reality that I have experienced. I know that God has not just the capability, but the desire to heal and rejuvenate me, but that he wants even more to have a relationship with me. This results in a paradox. When I am exhausted and stressed, the thing I need most is not rest, but to reach out consciously to God." "I love how CEM spurs the interns on to build relationships. I truly believe that is a key part in the 'training leaders' aspect of this ministry. Building relationships not only with the students, but also with the staff and spiritual partners. When I started I didn’t understand why we didn’t get a folder outlining who the students were and why they were here...I am convinced the goodness of life happens with relationships at the core. That is where you can spur each other on, call out the goodness and things that need correction. Deepness is in relationships and that is where God lives!" "My time at Christian Encounter Ministries has been more challenging, stretching and rewarding than I could have hoped for...I am overwhelmed by God’s goodness, faithfulness, forgiveness, discipline, and love that I have experienced and seen this year. The Ranch has opened my eyes to what truly matters in this life: love. The most rewarding experiences I have had at the Ranch have been the relationships I have had with both of the girls I have discipled." "I came into the internship certain that it would be an invaluable training ground for future ministry. But it proved to be so much more. I have gained more family than I could have ever imagined and feel better equipped to have my own. Jesus has given me new joy and freedom to walk in the abundant life He has for me and in so doing liberating others to do the same." "God has shown me that the Ranch is not the end for these students—it’s often just a beginning. My success must be based in how much I have been obedient to the Lord, and if I have been faithful in the works he prepared ahead for me to do. My job is simply to plant and water seeds; only God can bring growth." "I have been able to have countless conversations with students with tears running down their cheeks as they start to see that Jesus wants to be a part of their lives and love them just the way He made them. I have never in my entire life been in a place where the Lord’s hand was so obviously present. I am so forever grateful for the opportunity I had to build lasting friendships with these students who are so precious to me. " "I would describe my internship at the Ranch to be a lot like a boulder being thrown into a quiet pond. Before, things were comfortable, still, and stagnant. Now, that unhealthy peace has been interrupted by a great splash, and the ripples of that splash extend across the entirety of the water, creating waves which lap up upon the beach. That which is still is now moving, that which was comfortable is now crushed, stretched, and growth has begun...I believe that the half of this ministry which seeks to train leaders has planted valuable seeds of experience within my heart which, with God’s help, will take root and grow into an even more beautiful flower...I praise God that He was merciful enough to put me into a place where I wouldn't be comfortable, and I would suffer in such a way that would refine me. " "There were parts of me that felt unfit to be an intern. I knew that a lot of interns had graduated college and I hadn't. I asked myself if I was smart enough, or strong enough, or spiritual enough. I realized pretty quickly that it wasn't about me or my abilities, but that it was about God and His abilities. ...Being an intern is a hard job, and very challenging, but I always felt support from the CEM staff also. They really encouraged me to be who I am in my internship. I never felt alone or "thrown to the wolves." I felt like it was okay to make mistakes. I never felt pressured to be something I wasn't or to have to be an expert in an area that I wasn't, but I was still challenged to step out and do the things I wasn't comfortable doing. The staff always pointed everything back to Christ and reminded me that my motive should always be love." "A two-year internship at the Ranch is not like two years elsewhere. It is like five monumental years elsewhere. My college years were a time of great spiritual growth, yet I have grown more spiritually in the last two years than I did through all my college years. I have learned when I sacrifice, even a little, I see my heart conforming to the image of Christ. God’s way is better, I really do feel more blessed when I give than when I receive; being a peace maker is more satisfying than getting revenge, it feels better to serve than being served. Every time I obey I find that God satisfies and fulfills the longings of my heart and I get to experience the “abundant life.”...This is an amazing ministry. I have grown tremendously during my internship and feel equipped for the future to be a good father, husband, friend and servant." "Christian Encounter Ranch stands as a gateway—a place for an encounter—for those broken, sick, hopeless, bereaved, shattered, abused, forgotten, unloved, neglected, underappreciated, unapproachable, poor, lost and sinful... who are willing to come and find a new life fully illuminated by God’s grace and love, having transformed their lives. Removing pond scum carries with it a foul stench and disgusting sludge. Removing brush and branches from around uphill cabins is a difficult and slow operation. If these jobs themselves were not hard enough, the disposition of the students expressing immaturity, uncooperativeness and frustrated attitudes, heaped extra trouble on the situation. The entire group had to be addressed at least once. I have learned, at a very personal level, what situations like these require when you are in charge. These lessons scare and compel me to trust all the more upon the Lord, the only sure and true authority. As God has extended grace towards me, I know I need to extend grace and forgiveness to others. Christian Encounter has a fine balance of unique individuals working nicely in an integrated whole. I’ve felt appreciated, honored, respected and needed in this ministry and in my role as an intern....Returning to college with many unknowns, I can fully trust that God will direct my way and supply me with all I need to finish well." "This whole Ranch runs on God’s strength; the idea of the Ranch is crazy without Him. We are all inadequate and yet, God uses all of us...My natural tendency is to avoid conflict and to care for someone by giving them what they want. However, sometimes the best thing to do for someone is to say ‘no.’...The Lord used my break times to teach me how to really rest. With a limited amount of free time, as compared to college life, my personal time became sacred and I learned how to use it wisely....My time at the Ranch has been life changing. I became a part of the Ranch family that I intend to stay close to my whole life. The skills I learned here about interacting with people, in some ways, parenting skills, are ones I will take with me wherever God takes me." "I view the leaders at the Ranch as humble, determined, and strong. Humility and strength together are powerful; they enable leadership without aggression and ambition. This kind of leadership earns respect instead of demanding it, and is easy to follow. I feel called to leadership of some sort and it was very beneficial for me to have leaders who model these traits. I have learned from their example and have been encouraged in my calling." "The first night of my internship I heard loud swearing and things crashing, and saw a young woman bolt out of the lodge. This was my introduction to life challenges at CEM. Being an intern has been the hardest, best thing I have ever done in my life. I have grown more during the past two years than any other time period. I have seen and experienced peace, malcontent, joy, sorrow, love, hate, and the face of Jesus in every single person. Life at CEM is like frozen juice concentrate. Something hard and intense that becomes sweet and wonderful. My time of service and learning at CEM has changed me forever and I hope to continue allowing God to have full charge of my life." “I have been impressed with the significance of prayer and the focus on Jesus Christ that the leadership expresses on a regular basis, and how deliberate an effort is made to pass that on to the interns and students. “Where the Spirit of the Lord is, there is freedom.” This is a truth that comes to mind when I try to define what’s happening at CEM. "I would say that the most rewarding experience during my internship was the relationships that I developed...Even though I came into this internship wanting to share God's love and serve, I was also a recipient of God's love because other people from the Ranch family served me. I think that's just God's crazy way of working within the body of Christ. The more that you serve, obey, love and give the more you will be blessed... In my opinion, the CEM ministry to troubled students is on the front lines of a battle. Even though living in community is hard, CEM is providing students with everything they need to have their emotional, physical, spiritual, and mental needs met. I feel that CEM accepts both students and interns where they are but they love them enough to not leave them where they are." “All the “fights,” tears, laughter, friends, and family made here [at CEM] have filled my soul with a glimpse of how joyful eternity will be....I will always belong in this family of Christians. God has led me here and is blessing me everyday. I have witnessed people giving their lives to the Lord. I have made friends and had the opportunity to find healing in my personal life." 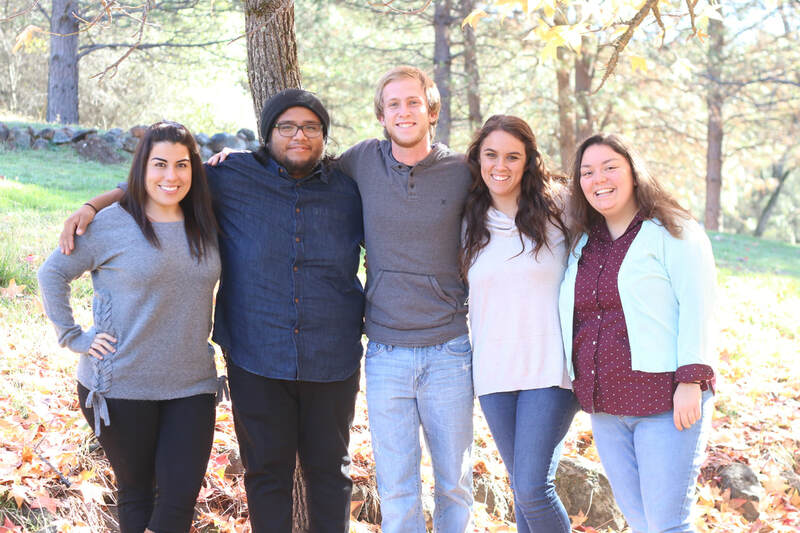 “I was told an internship at Christian Encounter Ranch would be an experience I’d find very demanding, challenging, trying, and mentally, physically, emotionally and spiritually taxing, as well as a host of other not so pleasant sounding descriptions. They were right. Yet, on the other hand, I was told an internship at Christian Encounter Ranch would be an experience I’d find very rewarding, fulfilling, inspiring and worthwhile, and one which I’d find hard to explain to someone else. They were very right. My internship has helped me to know what it means to be a disciple of Jesus and to commit myself to following Him forever. In turn, I have learned what is entailed in discipling others. I’ve realized the importance and need of being constantly aware of my own conduct, words, and actions as I am being watched by others just as I look to Jesus. My life IS my discipleship of the Lord; therefore, I need to continually examine myself to see what my life is teaching."